Very pleased to be included on Pigeonhole Books interesting blog of illustrator and author interviews. Pigeonhole aims to promote books for children which address the family and living situation realities of the 21st century. Dynamics overlooked by decades of children’s stories; yet the aim is not to highlight these situations as unusual, but bring them into the mainstream in print, reflecting their increasing visibility and normality in daily life. Blend of cartoon and illustration for 350.org.au – campaign to reduce global emissions to 350ppm, and generally to stop the march to climate change and environmental degradation in the name of profit. 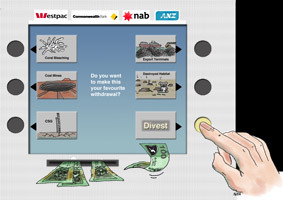 With 12 hour notice, brief was to promote campaign of divestment from Australia’s ‘big four’ banks. Image needed to read quickly yet also appeal to more engaged viewer, to both lure in the unconverted and bolster the troops. So successful locally, now to be used nationally.